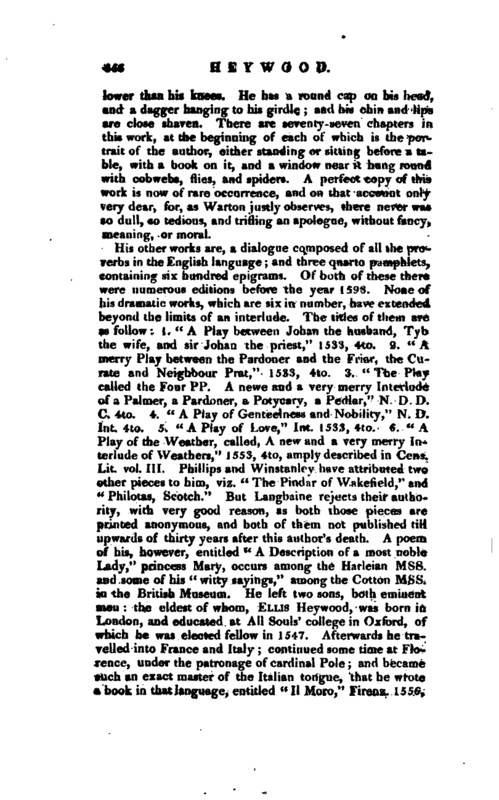 , one of the oldest English dramatic writers, was born at North Mims, near St. Alban’s in Hertfordshire, and received the first rudiments of his education at Oxford; but the sprightliness of his disposition not being well adapted to the sedentary life of an acader mician, he went back to his native place, which being in the neighbourhood of the great sir Thomas More, he presently contracted an intimacy with that Maecenas of wit and genius, who introduced him to the knowledge and patronage of the princess Mary. Heywood’s ready aptness for jest and repartee, together with the possession of great skill both in vocal and instrumental music, rendered him a favourite with Henry VIII. who frequently rewarded him | highly. On the accession of Edward VI. 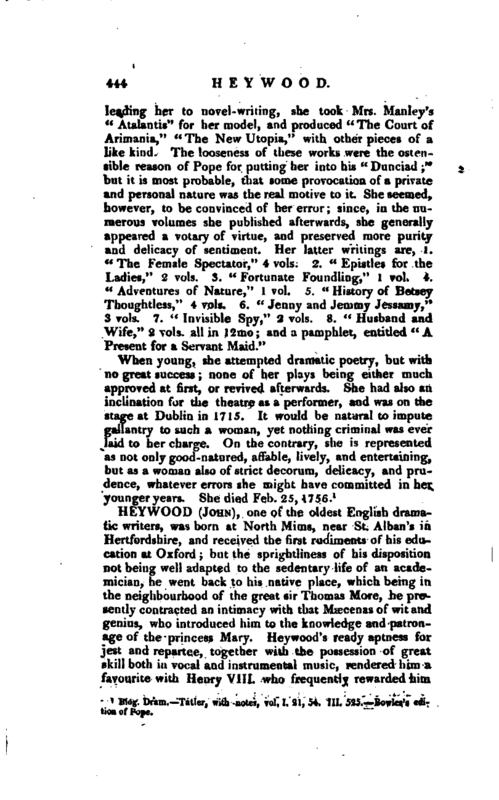 he still continued in favour, though the author of the “Art of English Poetry” says, it was “for the mirth and quickness of conceit, more than any good learning that was in him.” When his old patroness queen Mary came to the throne, he stood in higher estimation than ever, being admitted into the most intimate conversation with her, on account of his happy talent of telling diverting stories, which it is said he did to amuse her painful hours, even when she was languishing on her death-bed. His stories must have been diverting indeed if they soothed the recollections of such a woman. At the decease of that princess, however, being a bigoted Roman catholic, perceiving that the protestant interest was likely to prevail under the patronage of her successor queen Elizabeth, and perhaps apprehensive that some of the severities, which had been practised on the protestants in the preceding reign, might be retaliated on those of a contrary persuasion in the ensuing one, and especially on the peculiar favourites of queen Mary, he thought it best, for the security of his person, and the preservation of his religion, to quit the kingdom. Thus throwing himself into a voluntary exile, he settled at Mechlin in Brabant, where he died in 1565, leaving several children behind him, to all of whom he had given liberal educations. His character in private life seems to have been that of a sprightly, humourous, and entertaining companion. As a poet, he was held in no inconsiderable esteem by his contemporaries, though none of his writings extended to any great length, but seem, like his conversation, to have been the result of little sudden sallies of mirth and humour. His longest work is entitled “A Parable of the Spider and the Fly,” and forms a pretty thick quarto in old English verse, and printed in the black letter, 1556. 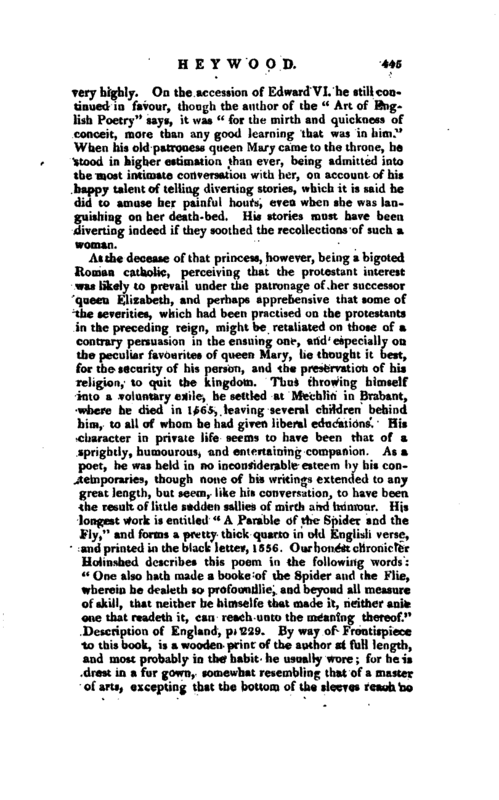 Our honest chronicler Holinshed describes this poem in the following words “One also hath made a booke of the Spider and the Flie, wherein he dealeth so profoundlie, and beyond all measure of skill, that neither he himselfe that made it, neither anie one that readeth it, can reach unto the meaning thereof.” Description of England, p. 229. By way of Frontispiece to this book, is a wooden print of the author at full length, and most probably in the habit he usually wore; for he is drest in a fur gown, somewhat resembling that of a master of arts, excepting that the bottom of the sleeves reach no | lower than his knees. He has a round cap on his head, and a dagger hanging to his girdle; and his chin and lips are ctose shaven. There are seventy-seven chapters in this work, at the beginning of each of which is the portrait of the author, either standing or sitting before a table, with a book on it, and a window near it hung round with cobwebs, flies, and spiders. A perfect copy of this work is now of rare occurrence, and on that account only very dear, for, as Warton justly observes, there never was so dull, so tedious, and trifling an apologue, without fancy, meaning, or moral. Cibber’s Lives. Biog. Dram. Philips’s Theatrum. Ellis’s Specimens. —Ath. Ox. vol. I. new edit, Cens. Lit. vol. III. IX. Warton’s Hist. 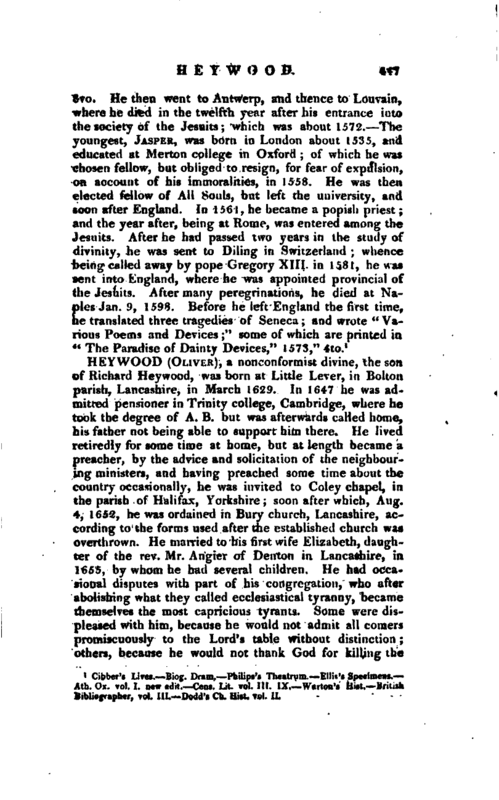 British Bibliographer, vol. III. Dodd’s Ch. Hist. vol. II.